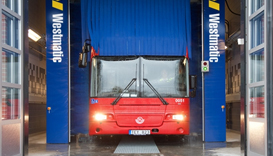 Westmatic's state-of-the-art drive-through large vehicle wash systems combine an ultra-compact design, along with a revolutionary operational concept. Our drive-through wash system is capable of washing vehicles ranging from transit-buses, tractor-trailers, school buses, motorcoaches, and even cars. Brushes overlap on the front and rear of the vehicle, and brush pressure is constantly monitored electronically. This provides for the safest and most consistent wash result. What makes the Westmatic drive-through stand apart from the competition is their incredibly compact design, reduced operator judgment, and unsurpassed versatility. 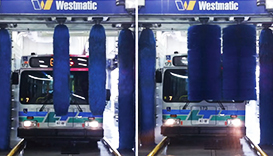 Thanks to their compact design / small footprint, Westmatic can often reduce wash bay space requirements. Therefore, reducing new build costs. 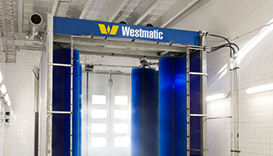 The compact design of the wash system also allows Westmatic to retro-fit into existing wash bays where competitors cannot. 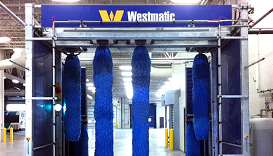 The vertical brushes on the Westmatic drive-through are capable of moving into the center of the wash bay and clean the fronts and rears with an overlapping movement. The overlapping brush movement eliminates any stripping down the rear of the vehicle, typically caused by brushes missing an area. This striping is most common with traditional vehicle wash systems that require the use of pneumatic air cylinders. 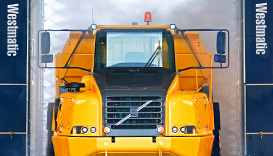 Our vertical brushes are capable of not only washing the front and rear but sides as well. 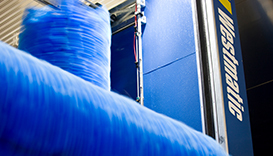 Westmatic's drive-through will use less water, chemical and electricity compared to traditional systems. Our nozzles have been designed and configured to use up to 50% less water, and our high-efficiency motors are less costly to operate. Unlike traditional drive-through wash systems, driver judgment is a non-issue while traveling through the wash. By simply following traffic light, the driver is guided through the entire wash process. The quality of the front and rear wash is not dependent on speed or driver accuracy. Instead of bringing the vehicle to the brushes, we bring the brushes to the vehicle. Providing for a consistent, and controlled wash process. While stopped, the front and rear of the vehicle are completely cleaned using our industry exclusive overlapping brush movements. 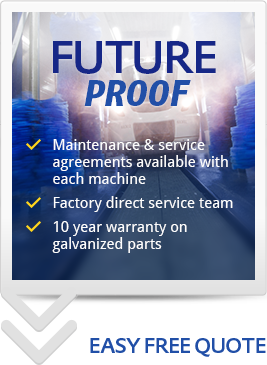 Equipped with the latest PLC technology (power line communication), Westmatic's wash systems incorporate the most advanced programming and unsurpassed control. All aspects of the system are constantly monitored and adjusted, ensuring the safest and most consistent results. Each system comes standard with an LCD touchscreen wash program selector, and step-by-step self-diagnostics and troubleshooting. Westmatic is also capable of wirelessly remoting into the equipment, to help diagnose and program. If you have any questions about our Drive Through wash systems, please fill out the form on our Contact Us page and we will be in touch with you as soon as possible.